Bjorn Fratangelo had a strong 2014 season. He won five futures titles and reached the quarterfinals of two challengers. The 21 year old finished the year with a career high ranking of 261. 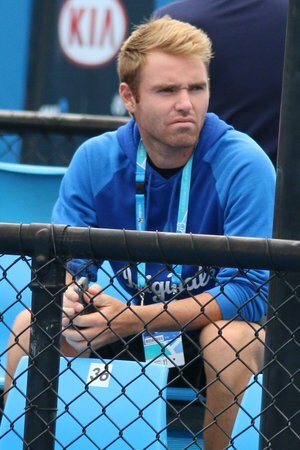 Fratangelo’s ranking was just on the border of making the Australian Open Qualifying cut, and when The Tennis Nerds spoke to Fratangelo back in November, the Pittsburgh native seemed pretty confident he would make that cut. Fast forward to January. Fratangelo flew to Melbourne after a decent week at the challenger in New Caledonia. He practiced with many fellow Americans, including his friend Bradley Klahn. As the days wound down, some players began to withdrawal and Bjorn was getting closer. Finally, the qualifying draw had come out; Fratangelo missed the cut by a mere two spots. “It was brutal to be two out. It hurt, but in a way it motivated me. I tried to take positives and make it a good training week. To just be around that atmosphere is unbelievable,” Fratangelo told The Tennis Nerds Monday. Despite missing the cut, Fratangelo stayed in Australia for three more weeks and played two $50,000 Challengers; Burnie and Launceston. He won two matches in Burnie before falling to Alex Bolt in the quarterfinals. However, Fratangelo’s trip down under was capped by the biggest accomplishment of his professional career, as he won his maiden challenger title in Launceston, defeating a promising 18 year old, Hyeon Chung, 4-6 6-2 7-5. Chung is already nearing the top 10o, and had just won the title in Burnie the week prior. The level of play from both, especially in the third set, was incredibly solid. Fratangelo had many chances in the third set, and finally broke serve after a marathon game at 5-5. On one deuce point, the two engaged in a very long exchange that ended with the American receiving some good fortune. “That crazy drop shot I hit at 5 all got under his skin a bit. That was the luckiest shot I’ve ever hit,” Fratangelo said. The title earned Fratangelo 80 ranking points, and he soared up the ATP rankings to a career high of #172 Monday. By comparison, in June of 2014, the American was as low at #535. The new ranking gives the American more opportunities to play higher level events. Fratangelo’s roommate in Florida is fellow young American Mitchell Krueger, who himself has had a nice start to 2015. You can read our Q&A with Krueger here. Krueger won the doubles title in Launceston with Radu Albot, taking out the team of Hubble/Statham 11-9 in the third set super-tiebreak. Fratangelo and Krueger have spent a lot of time together through juniors and now professionally. This entry was posted in ATP Challenger and tagged American Tennis, Australian Open, Bjorn Fratangelo, Challenger, Launceston, Mitchell Krueger, Tennis. Bookmark the permalink.